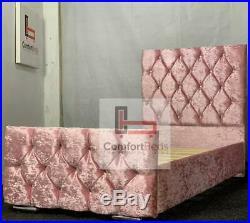 Princess Pink Crushed Velvet Upholstered Bed Frame 3FT/4FT/4FT6/5FT. PLEASE DO NOT THROW YOUR OLD BED SET AWAY BEFORE YOU RECEIVE YOUR NEW ONE. ALL OUR BEDS ARE MANUFACTURED IN THE U.
K NOT CHEAP IMPORTED FLAT PACK BEDS. THIS BED IS 100% UK MANUFACTURED AND COMPLIES WITH ALL BRITISH STANDARDS AND REGULATIONS THE BED IS HANDMADE BY HIGHLY SKILLED CRAFTSMEN/UPHOLSTERERS, THE BED IS A QUALITY THICK & STURDY BED FRAME. THIS BED FRAME CONSISTS OFF. 1 X FLOOR STANDING HEADBOARD. 1 X FOOT BOARD WITH CHROME FEET. 1 X WOODEN MIDDLE BAR. 3FT - LENGTH: 210CM WIDTH: 100CM. 4FT - LENGTH: 210CM WIDTH: 130CM. 4FT6 - LENGTH: 210CM WIDTH: 145CM. 5FT - LENGTH : 220CM WIDTH: 160CM. The courier company DO NOT deliver to the following locations: Channel Islands, Isle of Wight, Isle of Man, Scilly Isles, Scottish Highlands, Scottish Islands, Northern Ireland. In addition to the following areas any area north of Glasgow, the Grampians, Highlands, Isle of Wight, Northern Ireland, Republic of Ireland, Isle of Man, Scottish Islands, Channel Islands Devon and Cornwall. AB AB 1-9/14/ 21/22/23/30/ 31/32/33/34/ 35/36/37/38/ 39/41/42/43/ 44/45/51/52/ 53/54/55/56, KA 27-28, PA 20-39, PH 11-40, BT, IV, FK 19-21, KW, TR 21-25, HS, GY, JE, PO, IM, ZE. PLEASE ASK FOR A QUOTE BEFORE PLACING THE ORDER. The goods must be unopened, unused and in their original packaging. Due to hygiene reasons, we cannot accept any mattresses which have been unpacked or used. All of our items are packaged in heavy duty clear polythene and can be easily inspected. We will then send you a replacement. The item "Kids Princess Chesterfield Diamante Crushed Velvet Upholstered Bed Frame" is in sale since Saturday, April 6, 2019. This item is in the category "Home, Furniture & DIY\Furniture\Beds & Mattresses\Bed Frames & Divan Bases". The seller is "bargainbedzltd" and is located in Ellesmere Port. This item can be shipped to United Kingdom.